Does Eating Bananas Make You Fat? Some foods are more likely to make you fat than others, but bananas aren't particularly fattening. They're low enough in calories to make a healthy, filling snack without ruining your calorie budget. On the other hand, bananas aren't a calorie-free food, so their calories must be included as part of your daily calorie goals. Beyond their calorie count, bananas are packed with resistant starch and fiber, which is more likely to lead to weight loss than to weight gain. Bananas make a healthy addition to most diets and, when they're part of a balanced plan that supplies the right number of calories for your specific needs, they won't lead to weight gain. The calories in bananas are moderate enough to include in your diet without causing weight gain. A small banana contains 90 calories, and even an extra-large banana only has 135 calories, according to the USDA National Nutrient Database. The combination of this low calorie range with nutritional value means bananas are a healthy snack, suggests MedlinePlus. One large banana also fills 1 cup of the recommended daily fruit requirement of 1 1/2 to 2 cups. Bananas alone won't make you gain weight, but if they're part of a high-calorie diet, they'll be one of several foods that contribute to extra pounds. When you consume more calories than you need, the excess calories go into storage somewhere in your body. Some of them are stored as glycogen, which is then reused for energy when muscle activity increases. Unfortunately, the body has limited space for glycogen storage, so the remaining calories are converted into triglycerides and stored as fat. It takes 3,500 excess calories to add 1 pound of fat, so weight gain takes place over weeks of consistently consuming too many calories. If you ate one large banana every day — and the extra calories exceeded your daily calorie budget — it would take about 30 days for those extra calories to add up to a pound of weight. Bananas contain more starch than some other fruits, but that doesn't mean they'll make you fat. It's important to consider the type of starch, its calories and its overall impact on blood sugar. Bananas are one of the best sources of a type of starch called resistant starch, which, in your body, acts the same as soluble fiber. It passes through the small intestine without being digested, so it doesn't contribute the same calories as starch that's digested into sugar and used for energy. Then it promotes intestinal health because it's fermented by bacteria in the colon. Ripe bananas contain about 1.23 grams of resistant starch for every 100 grams of weight, reports the British Nutrition Foundation, which means that a large banana weighing 136 grams has nearly 2 grams of resistant starch. A large banana also contains another 3.5 grams of dietary fiber. All types of fiber are more likely to help you lose weight than to add pounds because fiber makes you feel full. Fiber and resistant starch also stop swings in blood sugar that can lead to weight gain. High levels of blood sugar increase the chance that more will be stored as fat, while low blood sugar makes you feel hungry, which may lead to overeating. One large banana has 31 grams of total carbs, which is 10 percent of the daily value based on a 2,000-calorie-a-day diet. Since total carbs include fiber and resistant starch, you can subtract them to get 25.5 grams of net carbs. Read more: Will You Gain Weight Eating 2,000 Calories a Day? While this is on the high end compared to some fruits, bananas aren't alone. For example, one large apple has 31 total carbs and 5 grams of dietary fiber, so it ends up with the same net carbs as a large banana. If you follow a low-carb diet, it will be more of a challenge to include bananas on the menu. The recommended dietary allowance for carbohydrates is 130 grams daily, according to the Food and Nutrition Board. Consuming fewer than 130 grams daily is considered low carb, although a standard definition of a low-carb diet hasn't been established. A diet with fewer than 30 grams of carbs daily is so low in carbs that it should be carefully planned together with a registered dietitian or your physician. The bottom line is that even if you calculate net carbs in a banana, one large banana provides nearly 20 percent of your total daily carbs if you consume 130 grams of carbs every day. Your diet may not be able to accommodate bananas if you consume fewer than 130 grams of carbs. Read more: What & How Much Can You Eat on a Low-Carb Diet to Lose Weight? An ergogenic aid is a technique or substance that facilitates physical exercise and improves athletic performance. 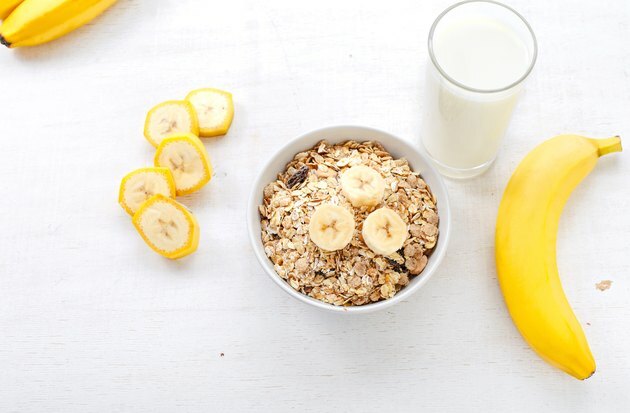 Some of the most important ergogenic aids are those that ensure muscles have sufficient carbs to support ongoing exercise, and bananas work well in this capacity. While this doesn't prove or disprove their influence on weight gain, it does highlight another role for bananas, which is their potential to help you lose weight by supporting an exercise regimen. In one study in which trained cyclists engaged in time trials, bananas sustained blood glucose and performance just as well as consuming a 6 percent carbohydrate drink, according to PLoS One. The researchers concluded that bananas are good for exercise because they contain a mix of carbs, antioxidants and nutrients, such as the electrolyte potassium. Another study looked at the impact of bananas and pears on the performance of male athletes during a cycling trial. Compared to ingesting only water, performance times were 5 percent faster when bananas were used for energy and 3 percent faster with pears, according a 2015 article published in the Journal of Proteome Research.